Lublin once served as one the most important centers of Jewish life, commerce, culture and scholarship in Europe. It had the world's largest Talmudic school, Yeshiva. Lublin was also well known for its fairs and market days. Little remains today of its past splendor. Jews came to Lublin as transients, in 1316. King Casmir III, in 1336, granted the Jews permission to settle on the outskirts of the city and King Sigismund I permitted Jews to settle near the castle. By the mid-16th century, an autonomous Jewish city existed in the district. Jews were given land to build their own institutions and a cemetery. Jews were able to set up stalls and shops to sell their goods. A Hebrew printing press was opened in 1547 and produced many important publication. In 1568, Jews were allowed to bar Christians from living in their district. 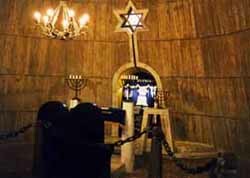 The 16th century was a period of growth and enlightenment for the Jewish community of Lublin, which had the third largest Jewish community in Poland in this period. The Yeshiva was established in 1515 by Shalom Shachna and became a center of learning Talmud and kabalistic mysticism. The great scholarship of those who studied there, including Moses Isserles Remuh and Jakov ben Itzhak, led to the city being named the "Jewish Oxford." The sages of the yeshiva received the title of rector and equal rights to those in Polish universities with the permission of the King in 1567. Also in 1567, Lublin’s most famous synagogue, the Maharshal Shul, was constructed. It was damaged in the great fire of 1655 and was subsequently rebuilt. Lublin also had strong communal institutions, such as a hevra kaddisha (responsible for burials) and a "preachers" house for visiting preachers. The city also hosted the Council of the Four Lands, the ruling political body for Jews in Poland and Lithuania established in 1580. Tensions existed in Lublin between the 16th and 18th centuries between the Jews and the Polish High Court. Blood Libel cases at the Polish High Court led to attacks on Jews and their homes. In 1648-49, during the Chmielnicki uprising, many Lublin Jews suffered immensely. The Jewish population of Lublin numbered 2,000 in 1602. In 1655, the Cossack and Muscovite armies attacked Lublin and burned down the Jewish quarter, killing more than 2,000 people. Following this destruction, Jews began to buy shops in the Christian quarters of the city, which was not well received by the townsfolk. By 1787, the Jewish district was rebuilt and had a population of 3,500. During the late 18th century, Lublin became a center for Hasidism. One famous Hasidic figure was the Tzaddik Jacob Isaac ha Hozeh (1745-1815), who became known as the Seer of Lublin. While blind, it was said that the Seer was able to see directly into people's souls. He died mysteriously by falling out of his window. The Eiger Hasidic dynasty also played an important role in the rise of Hasidism in Lublin. At this time, opponents of Hasidism from the mitnagdit movement were also present in Lublin. Both groups had their own yeshivas and heders (small elementary schools). In the 19th century, Lublin's Jews were only allowed to live in their own districts. Jews faced similar restrictions in other Polish towns during the partition period. They were permitted to buy land for civic purposes in 1862. At the time, the Jewish population was approximately 9,000. Jewish commerce and industry expanded during the second half of the 1800's. In 1860, a Jew owned the largest cigarette factory. Jews owned 95 percent of businesses in the tanning industry. Jewish workers became an important sector of Jewish society. Trade unions were formed and the Bund became active in the early 1800's. A Jewish hospital was open in 1886, which contained bedrooms and a small synagogue. By the late 19th century, students in Jewish schools were taught in either Russian or Polish. In 1897, the first Hebrew school was established. By this time, the population had more than doubled the figure of 40 years earlier, reaching nearly 24,000. In 1917, the community of Wieniawa combined with the Jewish community of Lublin. After World War I, a number of Jewish organizations and institutions were started in politics, education, theatre and sports. A number of printing houses were functioning and producing works in Hebrew. A great yeshiva, Yeshiva Hachmei Lublin (Jewish Rabbinical Academy), opened in June 1930 with 200 students. Unfortunately, Meir Shapiro, its founder, died at the age of 46 and did not live long enough to see the first class graduate four years later. The books in the library were confiscated by the Nazis, in 1940 and the equipment was stolen or destroyed. The Germans captured Lublin on September 18, 1939. The Jewish population doubled again by 1941 and reached about 45,000, including 6,300 refugees from other cities. Lublin became a center of mass extermination of Jews during the Holocaust. A Judenrat was formed on January 25, 1940. The Judenrat executed Nazi orders, as well as, established public kitchens, hospitals and hostels for abandoned children in the ghetto. The Nazis established two ghettos, with a population of 34,000. Exit from the ghetto was restricted in April 1941. Deportations began, at a rate of 1,500 daily, on March 16, 1942. A total of 30,000 Jews were deported to Belzec or murdered on the way in nearby forests. The remaining 4,000 were transferred to Majdan Tatarski, a suburb of Lublin, which became a "small" ghetto. On September 2, 1942, 2,000 Jews were killed by the Nazis and another 1,800 were murdered in October 1942. The remaining 200 Jews were sent to Majdanek. A small number of skilled craftsmen were able to stay in and work in Lublin. Their shops were closed in May 1943 and the workers were sent to Majdanek. Another 300 craftsmen were kept at the Lublin Fortress and worked until July 1944; they were put to death a few days before the Nazis evacuated the city. Lublin also hosted a prisoner of war camp for Jews serving in the Polish army. Arriving in February 1940, they were initially helped by the Judenrat and some succeeded in getting forged documents allowing them to leave the camp. 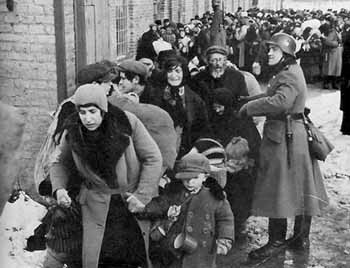 Some of the prisoners escaped to the local forests and joined partisan groups; however, many were deported along with the other Jews. The last deportation of prisoners took place on November 3, 1943, to Majdanek. Lublin was the first city liberated in Poland by the Russian army on July 24, 1944. Lublin served as a temporary Polish capital until the liberation of Warsaw in January 1945. After the war, 5,000 Jews settled in Lublin, many of whom lived in the Soviet Union during the Holocaust. Many of the Jews left Lublin between 1946-50 because of anti-Semitism. A mass exodus took place after the Kielce Pogrom. A Jewish cultural society was active in the city until 1968, when the remainder of the population left Poland. Today, there are only 20 individuals associated with the Jewish community of Lublin and all of them over the age of 55. There may be as many as 40 others unaffiliated with the community. Very little remains of the former Jewish quarter of Lublin. There is a monument to the victims of the Holocaust in the square between ul Rady Delegatow and ul. Hanki Sawickiej. One small synagogue remains on the upper floor of the building on ul. Lubartowska 8/10. At the synagogue, there is a small display of ritual and historical documents of the Jewish community of Lublin. Commemorative plaques can be found at the base of the castle steps for the Jewish town that stood at the spot. Another plaque can be found on the inside of the walls at ul Grodzka 11, the site of the former Jewish orphanage, where Jewish children were murdered by the Nazis on March 24, 1942. The former yeshiva, built in 1924 on ul Lubartowska 85, is the current Medical Academy building. Inside, there remains an old lecture room of the yeshiva, as well as commemorative room showing the history of the building. The old Jewish cemetery attracts many visitors. It contains tombstones dating back to the early 1500's. It is the oldest Jewish cemetery in Poland, which still exists. Many of the tombstones were destroyed by the Nazis, however, some remain. 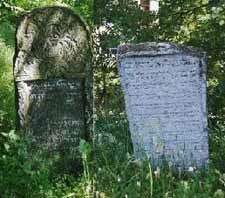 The cemetery contains the tombstone of Jacob Kopelman ha Levi (died in 1541), which is the oldest tombstone in Poland, the tombstone of Shalom Shachna, who died in 1558 and the tombstone of Tzaddik Jacob Isaac ha Hozen (1745-1815), the Seer of Lublin, which is a site of pilgrimage for Jews around the world. A new Jewish cemetery, on ul. Waleczynch, was established in 1829 and was seriously damaged during the Holocaust. It is still used today by the small Jewish community and has a number of Holocaust memorials. Restoration of the cemetery has begun. About two miles from Lublin is the Majdanek death camp. Among the estimated 150,000 people who entered Majdanek as prisoners, about 80,000were killed and 60,000 of them were Jewish. The State Museum at Majdanek documents the history of the camp and includes a monument made from mounds of human ashes commemorates victims of the Nazi extermination. Sources: "The History of the Camp," State Museum at Majdanek (copyright 2006, accessed August 2013).